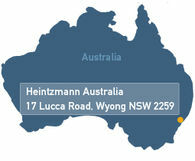 Heintzmann Australia Pty Ltd was founded in 2010, its major shareholder, the Heintzmann Group - a family-owned group in operation for 165 years that is strongly connected with the mining industry worldwide, offering a wide range of mining related services. Together with the associated companies of the Heintzmann Group in Europe and the United States we are in a position to combine global experience with local knowledge to develop new technical solutions. We are commited to building a trusted relationship with our customers by offering quality products and services. We look forward to providing you more information. To receive information on our products or make an enquiry about our products.